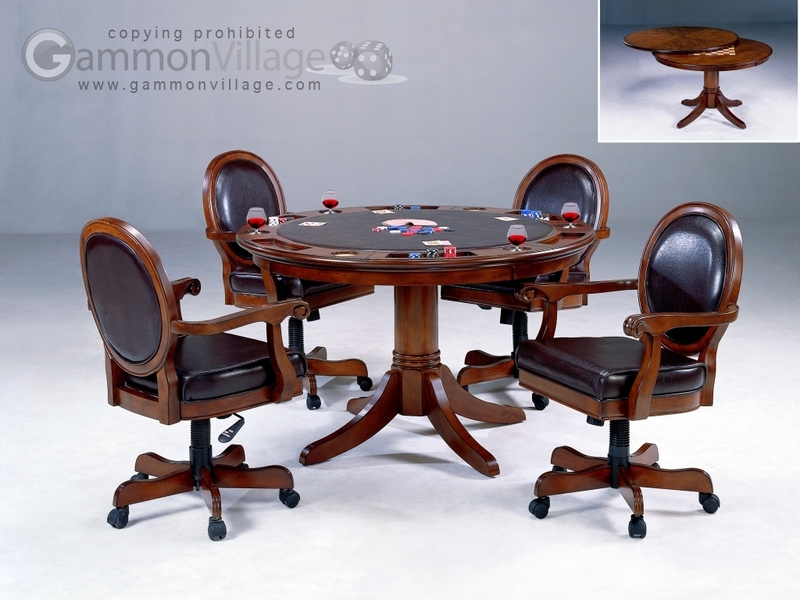 Hillsdale Furniture takes your game room to a whole new level with our Warrington game table. Our multi-functional table offers a flip top that allows for a dining surface on one side and a game surface complete with chip trays and drink holders on the other. Feel like checkers or chess? Take off the entire top, and you’ll find a built in board. Finally, we have created a collection that is not only functional and affordable, but attractive. The Warrington features a rich cherry finish and traditional design elements. This table is the perfect way to turn your kitchen or dining room into an entertainment hot spot for friends, family and fun. Table Height: 31" Width: 52" Depth: 52"
Table Care: Dust frequently using a clean, specially treated dusting cloth that will attract and hold dust particles. Do not use wax or abrasive cleaners as they may damage the finish. Page P2552 Copyright © 1999-2019 GammonVillage Inc., USA. All rights reserved.